Today we had to say good bye to “Shelby” A/C Ch. McCarthy’s Irish Eyes, the ‘ole lady’ of the house. She was diagnosed with cancer yesterday. It was the first day that she actually looked like she was not feeling well and she just started to get weaker and weaker in front of hour eyes. Just Sunday night she almost took one of Julie Desy’s fingers off as she was handing out leftover liver from the dog show. We first met Shelby when she was about 8 or 9 moths old. She had come into her first season and our friend Debbie Ross, her breeder asked us to watch her for a couple of weeks so Shelby wouldn’t drive her stud dog’s nuts. So Shelby was staying here and one afternoon my daughter Dana called Mary and asked. “Mom, would you be mad if Shelby ate the arm of the couch?”  Mary said “Which couch are you talking about; the upstairs couch in the formal living room or the downstairs couch in the family room”. Dana then queried “Which one would make you the maddest?” Well, Shelby ate the arm of the upstairs flowered patterned, linen covered couch in the formal living room J. From that day forward Shelby “the puppy” became Shelby “The Couch Eater”. Four or five years later Debbie was getting ready to move to Florida and she approached Julie Desy about placing some of her dogs. Julie suggested that Debbie call us. Debbie then called us on Walt’s Birthday and offered to sell us Shelby. We had always loved Shelby. Every time we went to Deb’s Shelby was always in Walt’s face and lap so of course we just had to have her. When Walt met Debbie at the SSCGD Specialty to pick up Shelby all he had was a flexi lead, he slipped it over her head and was standing there watching the show when Shelby saw Sandy Stanfill in the ring with another dog. Shelby slipped the flexi off her head and ran in the ring and stood and baited in front of Sandy, as she had done many times before. We knew then and there we had a show dog! We had a lot of fun finishing her championship as she went on to win her majors with WB and BOW at the Three Rivers SSC under Barbara Thompson and WB and BOW at the Interlocking SSC under Charlotte Tull. And then her final point with back to back BOB wins at the Rubber City KC shows under Nioma and Tom Coen. Shelby quickly became #1 in the house. She was the official greeter demanding attention from everybody who visited us. She loved the kids and grandkids. She loved to play ball in the yard with them. We will miss our evenings together, sitting on the couch watching TV, with her lying on my lap and giving us her “old woman” kisses. It is because of “Shelby Sue” that we can now sit in our living room and look at all these beautiful dogs with their lovely temperaments. 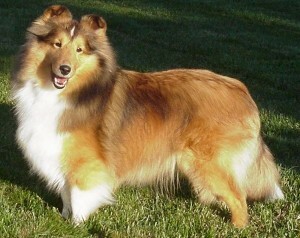 Shelby holds the honor of being the foundation, the rock upon which Neahm Shelties was built. She will always have our hearts. Her legacy lives on through her get and their kids, some of which are listed below. We lost a sheltie friend today. We first met him in the fall of 1997. We were introduced to him by Debbie Ross and Doreen Payne. From that day we became friends, actually more than friends we were each others support group. He taught us how to win and lose gracefully, no matter what happened in the ring when it was over you congratulated the winners and consoled the losers. He taught us no matter what happened in the ring we were still friends and we still loved each other when we went home. Then he did some thing even more extraordinary, he taught the same lessons to our daughter Dana. He taught her it was not the winning or the losing it was all in how you presented yourself to the world. Then later he taught us how to grow old gracefully with dignity and a quiet reserve. He also taught us how to love people and life, take each day as it comes, and relish the warmth of the sun. He taught all of this without ever saying a word, because our friend and 4 legged mentor was “Rebel” Shantro’s Devil In Disguise. Rebel came to live with us at the age of 4 back in 1997 through the generosity of Doreen Payne of Shantro’s Shelties in Canada. We quickly formed a bond with Rebel that endured for the next eleven and a half years until he passed away in Walt’s arms this morning of old age. Good bye old soul until we meet again.